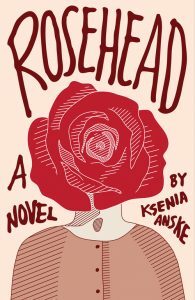 Congratulations to Ksenia Anske, a Seattle-based author, for winning an honorable mention in the Young Adult fiction category of the 2016 Indie Ebook Awards from Library Journal for her novel Rosehead, also available in paperback! Synopsis: Misunderstood and overmedicated, twelve-year-old Lilith Bloom finds the prospect of a grand family reunion decidedly dull... That is, until she discovers that the rose garden surrounding her grandfather's Berlin mansion is, well, completely and utterly carnivorous. Armed with Panther, her talking pet whippet, and the help of the mute boy next door, Lilith must unravel the secrets behind the mysterious estate, all while her family remains gloriously unaware that they are about to be devoured. And check out the first line: "Lilith Bloom had a peculiar feeling that the rose garden wanted to eat her." One award winner and two finalists were selected for each genre, and, in addition to receiving full online reviews from Library Journal, all will be recognized at the 2017 American Library Association Midwinter Meeting in Atlanta, Georgia. Anske was kind enough to answer a few questions about her book and her experience with self-publishing. Why did you choose to self-publish Rosehead? My first trilogy Siren Suicides deals with teenage suicide. When several agents told me it’d be a hard sell, my readers urged me to self-publish it. So I did. A year later my second book was finished—Rosehead. As I was writing it, I talked about it on my blog and on social media, and everyone was so excited (me including), that it didn’t even cross my mind to look for agents again. I was burning to publish it and to start writing my next book. Which is what I did. Soon self-publishing became routine, and I fell in love with it. It allowed me to focus on writing more books and on studying my craft. I write, self-publish, repeat. If the day comes when an agent decides to strike up a conversation, so be it. Until then I’ll keep writing and learning. And more specifically, why did you submit the novel to the Self-e library platform? All of my books are available as free downloads on my site and on a few book-sharing sites like Wattpad. I've uploaded Rosehead there and for the most part forgot about it. I’ve also submitted the opening to Rosehead for the Amtrak Residency Program and promptly forgot about it too. Then suddenly I won the residency, and several months later Rosehead's readership on Wattpad exploded. The book got selected for all kinds of reading lists, and I think someone at some point told me about Self-e. I can’t remember now who it was. “You should submit your books there!” I was told. So I did. And look, it won an Honorable mention! I couldn’t believe it. Such an honor. What inspired your writing of Rosehead, literary or otherwise? There are two answers to this. One is long and dark—my own story of growing up with ADD and PTSD. You can read about it in this blog post, but I warn you, it might be too disturbing for some readers. The other one is short and cheery—it was inspired by a nightmare. Well, not so cheery perhaps, but well within the mood of the book. I dreamed about a creepy old man who had a rose garden and who has spent his free time luring in lovely old ladies to have tea with him. Once in his kitchen, he’d scald them with hot tea as though by accident, and then…I guess I tried to make this cheery and failed. Oh well. The book itself is not as dark as its beginnings, and so many readers have asked me to write a sequel to it, that I will. It will be called Dogwood, and it will have dogs in it. That’s all I can tell you now. Do you have any recommendations for other self-published books library readers might enjoy? I mostly read traditionally published books. The two self-published books I fell in love with have since been picked up by large publishing houses: Wool by Hugh Howey and The Martian by Andy Weir. There is, however, a rare gem of stories written by high-school students, stories of their real-life struggles: homelessness, abuse, addiction, and mental illness—I’m Finally Awake: Young Authors Untangling Old Nightmares, compiled and published by Marjie Bowker. This book came out of the Scribner Lake High School Program in Edmonds, which my step-daughter attended. It’s a collection of amazing strength and talent, and I hope these young writers continue writing and inspiring others to join them in sharing their stories.